Cheese cake is a divine treat in itself and when chocolate is also introduced to the mix, the end product is simply sumptuous. 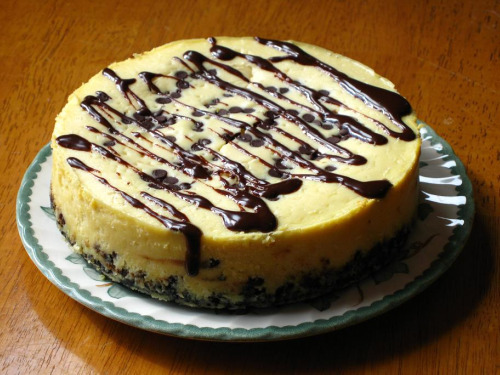 In this article we will introduce an excellent recipe for chocolate chip cheese cake. The recipe is a bit thorough, but when it comes to cheese cakes, taste comes with time. The first step is to preheat the oven at 300 degree F.
Take a medium bowl and combine the cookie crumbs with butter until the crumbs are totally moistened. Now take a spring form pan (9-inch) and press the combination onto its bottom. Follow this by sprinkling 1 cup of morsels. Now take a large bowl, add cream cheese, sugar and vanilla extract into it and beat until smooth. Now combine the eggs and flour and beat again. Follow it by adding evaporated milk and sour cream and beat again extensively. Pour the crust and sprinkle the remaining morsels on the top. The first stage of baking lasts for approximately 25 minutes. After this cover the tray loosely with a foil. Bake for another 40 minutes until the edges are set. At this point the centre of the mixture will still be a bit loose. Now place the cake in the refrigerator for about two hours, at which point it gets firm. You can now remove the side of the spring form pan.